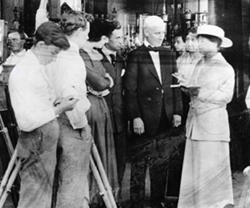 ALICE FEST is named for Alice Guy-Blaché (1873 – 1968) a filmmaking pioneer and one of the first film directors. Born in Paris, her career in filmmaking spanned more than twenty-five years, involving her directing, producing, writing and/or overseeing more than 700 films. She directed her first movie in 1896 and from 1896 to 1906, she was Gaumont Film Company’s head of production. 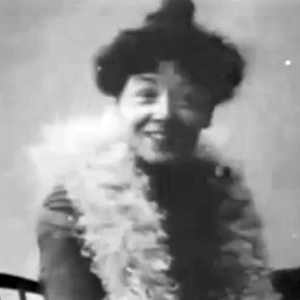 She directed hundreds of short films, pioneering many cinematic techniques and has been considered by some film scholars to be the first filmmaker to systematically develop narrative filmmaking. Watch clips from some of her films and learn more about her life HERE. Guy-Blaché was also one of the pioneers in the use of recordings in conjunction with the images on screen in Gaumont’s “Chronophone” system, which used a vertical-cut disc synchronized to the film. An innovator, she employed special effects, using double exposure masking techniques and even running a film backwards. She moved to the United States where in 1910 in partnership with her husband Herbert Blaché and with George A. Magie, she founded The Solax Company, the largest pre-Hollywood studio in America. 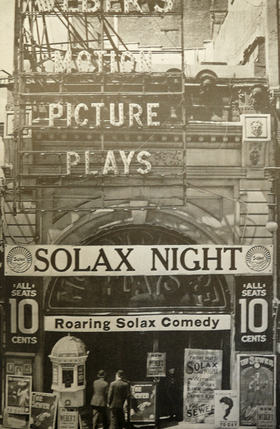 After Solax ceased production, Alice Guy-Blaché went to work for William Randolph Hearst’s International Film Service. She and her husband divorced and she returned to France in 1922; although she never made another film, for the next 30 years she gave lectures on film and wrote novels from film scripts. All but forgotten for decades, in 1953 the government of France awarded her the Legion of Honor. Alice Guy-Blaché never remarried and in 1964 she returned to the United States to live with one of her daughters. She died in 1968 in Mahwah, New Jersey.